By olduvai in Economics on November 2, 2018 . The “up to” exacts its pound of flesh. The Fed acquired Treasury securities and mortgage-backed securities (MBS) as part of QE, which ended in 2014. Between the end of QE and the beginning of the QE Unwind in October 2017, the Fed replaced maturing securities with new securities to keep their levels roughly the same. 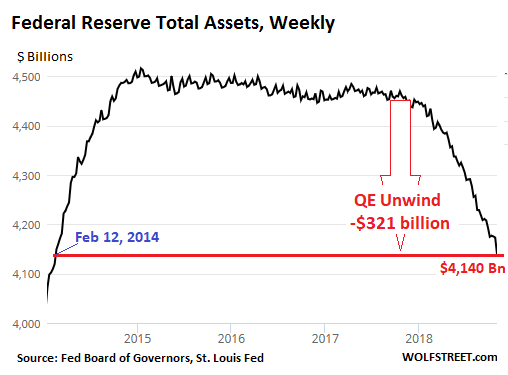 In October last year, the Fed kicked off the QE unwind and began shedding those securities. But the balance sheet also reflects the Fed’s other activities, and the amount of its total assets is always higher than the sum of Treasury securities and MBS it holds. 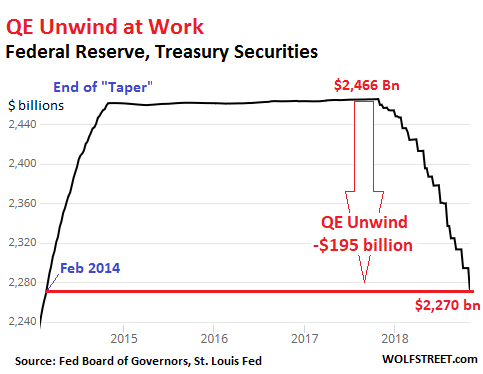 October was a new milestone: the QE unwind left the ramp-up phase and entered the cruising-speed phase, according to the Fed’s plan. In the cruising-speed phase, the Fed is scheduled to shed “up to” $30 billion in Treasuries and “up to” $20 billion in MBS a month, for a total of “up to” $50 billion a month. The plan calls for shedding “up to” $30 billion in Treasury securities in October. But the Fed shed only $23.8 billion. Why?